Please review our Pass & Order Info (required reading) prior to purchasing. * Prices do not include fees. 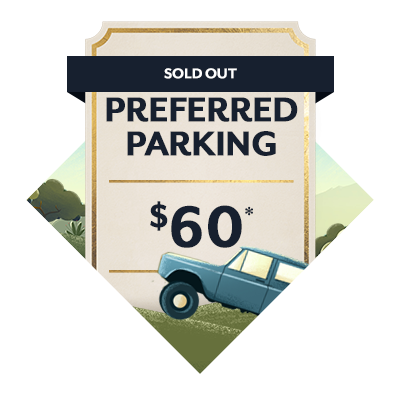 General Admission includes entry to the festival, access to food/beverage vendors and day parking for the weekend. Each order will receive ONE (1) complimentary Day Parking pass (good both days). To request additional free parking passes, please contact ticketing support at 855-273-4481. Separate VIP entry at all festival entrances. Easy access to/from The Oaks and Sycamore stages within the VIP footprint. Exclusive food & beverage offerings. Full bars plus specialty brewers. Shaded structures, plus additional seating consisting of picnic tables, benches & ottomans. Please note, blankets and chairs are not permitted to be set up in the VIP areas. There will be a complimentary coat & bag check (chair/blanket check) available. All of the perks of VIP. Exclusive entry to The Clubhouse indoor air-conditioned lounge and full bar. Up front main stage viewing areas only accessible to artist guests and Clubhouse pass holders. Exterior patios with views of both The Oaks and Sycamore stages. 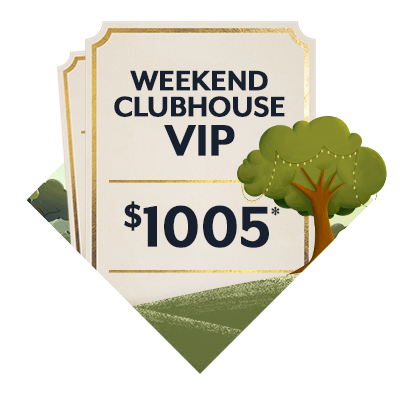 Priority Clubhouse parking included steps away from a dedicated VIP Clubhouse Entrance . Complimentary wine & beer tastings from Domain LA, Smog City Brewing plus Cha Cha Kombucha. Culinary passed hors d’oeuvres from Gwen, Rose Cafe, Ms Chi, Chef Steven Fretz and Heather and Jenny Engel. Festival mixology by Jason Eisner with signature cocktail tastings. Complimentary bottled water all day. This top tier pass is only available in a limited quantity. General Admission includes entry to the festival, access to food/beverage vendors and day parking for a single day. Each order will receive ONE (1) complimentary Day Parking pass. To request additional free parking passes, please contact ticketing support at 855-273-4481. Please note that there are no blankets or chairs permitted in the VIP areas. Easy access & guaranteed parking within minutes from festival entrance. Closest parking available to venue. No overnight parking. No RVs permitted. No tailgating. No Camping. Special Edition Arroyo Seco Weekend 2018 Lineup Poster (18"x24"). Poster will be shipped in June. To update your shipping address on file, please contact Ticket Purchase Support at support@festivalticketing.com or (855) 273-4481. Deadline to change shipping address is June 15, 2018. During the specified sales period, tickets are available exclusively to all American Express® Card Members (including International Cards). Tickets must be purchased with an American Express Card (including International Cards). Standard service charges apply. Offer is subject to availability. Not all seats are available and blackout dates apply. All sales final. No refunds. No exchanges. Offer may be changed or revoked at any time at the sole discretion of American Express. Some events may not be accessible to Card Members with disabilities.